If you’re like me, you like to have your lists to check off. It gives me a feeling of satisfaction and completion. 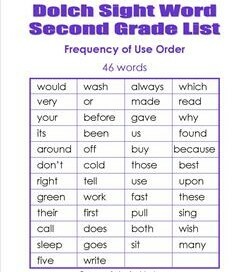 In this section you will find two lists of second grade sight words, Dolch sight words and Fry high-frequency words. 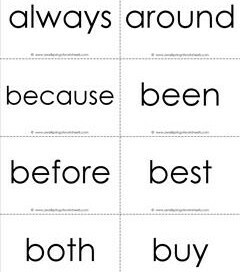 Between the two of them that’s about 150 words it’s recommended your kids learn by the end of second grade. However, with your curriculum added to these, your kids will come out far above that number. Just remember, numbers aren’t the goal. 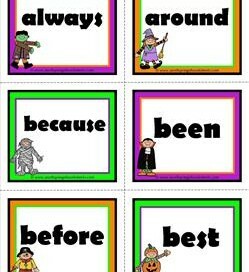 Fluent grade level appropriate reading is. Hope these resources help! 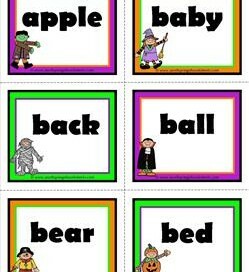 Go to this page to choose from all the sight word resources on this site. 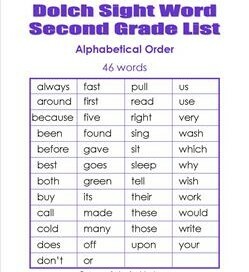 This is my second grade Dolch sight words list surrounded in purple with the 46 words in alphabetical order. 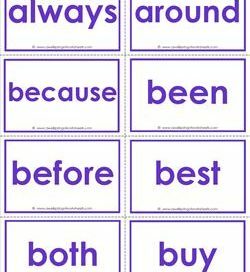 Here you will find second grade Dolch sight words in a purple theme in the order these 46 words are most frequently used. This is a list of all 95 Dolch nouns. 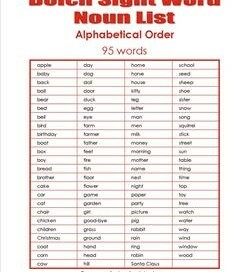 These words were commonly used nouns in the time Edward Dolch did his sight words research in the 1930’s, but are still applicable today. Dolch phrases are served right up on two pages of a pretty color blue. Three columns per page with 25 words per column. 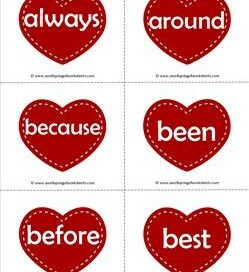 Each common phrase uses at least one Dolch sight word. 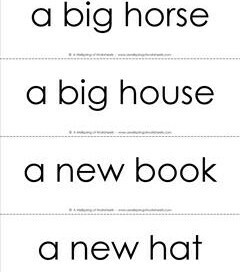 This set of my Dolch sight word flash cards for second grade comes in black and white. It has 46 words, is 6 pages, 8 words per page. This set of Dolch sight word flash cards for second grade comes in a pretty soft purple. It has 46 sight words, 8 words per page. 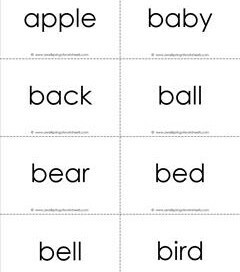 Our Dolch sight word flash cards – nouns – black & white – have 95 nouns for K-3rd. Twelve pages, 8 words per page. 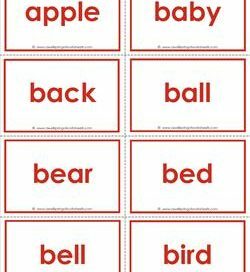 Our Dolch sight word flash cards – nouns – in red have 95 sight words for kinder-3rd grade. Comes with 13 pages, 8 words per page. 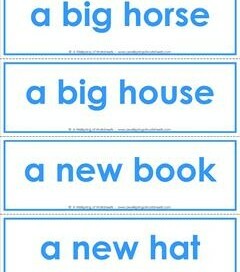 Our Dolch sight word phrases flash cards have 150 phrases for K-3rd grade, 38 pages, 4 phrases per page. 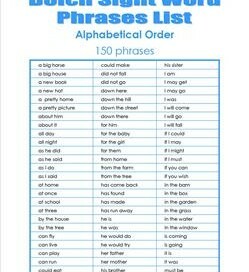 Our blue Dolch sight word phrases flash cards have 150 sight word phrases for kinder-3rd grade, is 38 pages, 4 phrases per page. 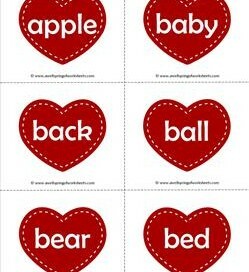 Show your love with this set of Valentine hearts Dolch sight word flashcards. Smooch! Nine pages, 46 words, six words per page. What deal could be sweeter? Seventeen pages of Dolch sight word flashcards with 95 nouns. 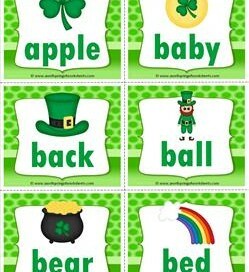 Follow the rainbow to the pot of gold with my St Patrick’s Day Dolch sight word flashcards! Nine pages, 46 words, six words per page. Don’t get pinched! Get some green in your classroom with these St Patrick’s Day Dolch sight word flashcards. Grab your black cape like Dracula and sink your teeth into some really cute Halloween Dolch sight word flashcards! Nine pages. No monster mash or graveyard smash here! Just adorable characters on Halloween Dolch sight word flashcards.